Western blot analysis of extracts from various cell lines, using eIF4G Antibody. 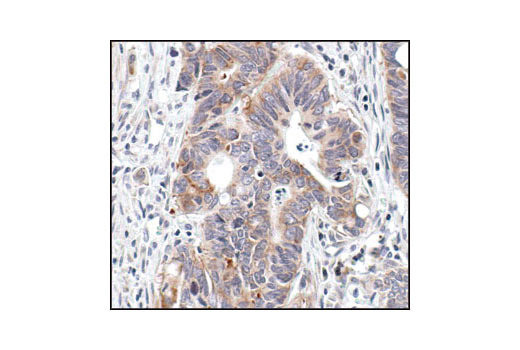 Immunohistochemical analysis of paraffin-embedded human colon carcinoma, showing cytoplasmic localization, using eIF4G Antibody. 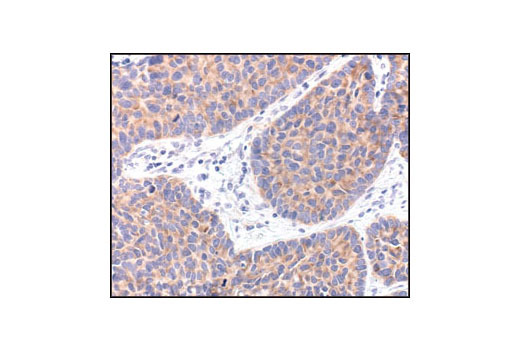 Immunohistochemical analysis of paraffin-embedded human lung carcinoma, showing cytoplasmic localization, using eIF4G Antibody. 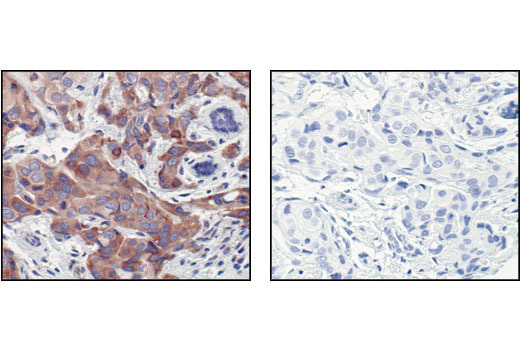 Immunohistochemical analysis of paraffin-embedded human breast carcinoma, using eIF4G Antibody in the presence of control peptide (left) or eIF4G blocking peptide #1003 (right). 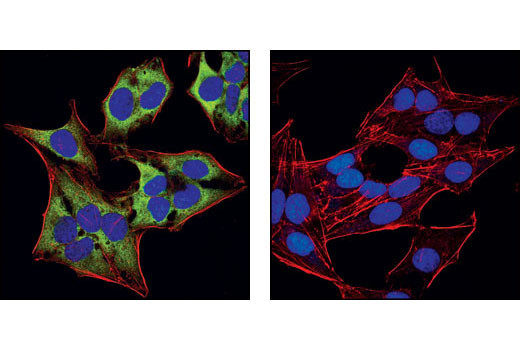 Confocal immunofluorescent analysis of HeLa cells, using eIF4G Antibody (green, left) compared to an isotype control (right). Actin filaments have been labeled with Alexa Fluor® 555 phalloidin (red). Blue pseudocolor = DRAQ5® #4084 (fluorescent DNA dye). 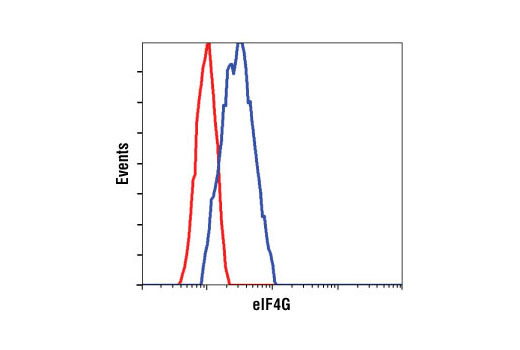 Flow cytometric analysis of HeLa cells, using eIF4G Antibody (blue) compared to a nonspecific negative control antibody (red). 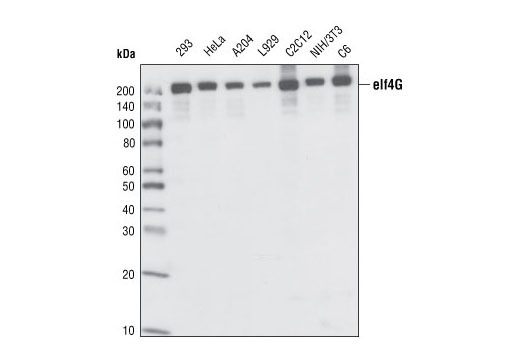 eIF4G Antibody detects endogenous levels of total eIF4G protein. Polyclonal antibodies are produced by immunizing animals with a synthetic peptide corresponding to a sequence of human eIF4G. Antibodies are purified by protein A and peptide affinity chromatography. The initiation of translation is an important biological event and a variety of factors contribute to this process. Members of the eIF4 translation initiation factor family bind to the 5' m7GTP mRNA cap and unwind the mRNA secondary structure (1,2). The amino-terminal portion of eIF4G physically associates with eIF4E to stimulate the binding of eIF4E to the mRNA cap structure (3). eIF4G also interacts with eIF3 and eIF4A and serves as an adaptor molecule in the eIF4 complex (4). Moreover, eIF4G plays a role in internal ribosomal entry site (IRES)-mediated initiation of translation (5,6). The eIF4G family includes eIF4G1 (eIF4GI), eIF4G2 (p97, DAP5 or NAT1), and eIF4G3 (eIF4GII) (7). These factors share a homologous sequence that provides for interaction with initiation factors eIF3 and eIF4A. Both eIF4G1 and eIF4G3 are involved in cap-dependent translation, while eIF4G2 plays a role in IRES-mediated translation of some genes during cell stress (7,8). Yan, R. and Rhoads, R.E. (1995) Genomics 26, 394-398. Morley, S.J. et al. (1997) RNA 3, 1085-1104. Haghighat, A. and Sonenberg, N. (1997) J. Biol. Chem. 272, 21677-21680. De Gregorio, E. et al. (1998) RNA 4, 828-836. Ohlmann, T. et al. (1996) EMBO J. 15, 1371-1382. Borman, A.M. and Kean, K.M. (1997) Virology 237, 129-136. Henis-Korenblit, S. et al. (2002) Proc. Natl. Acad. Sci. USA 99, 5400-5405. Nevins, T.A. et al. (2003) J. Biol. Chem. 278, 3572-3579.